The other day, my husband asked our kids to clean the play room. It should have taken them less than half an hour. Instead it took f-o-r-e-v-e-r (according to one of my children). They’d clean for a minute, then collapse on the floor in exhaustion. I mean, it takes a lot of effort to pick up a Barbie shoe. Then they would harp on each other for not working hard enough. Or for having too many Hot Wheels. Or for dumping the box they’d just filled with those crazy making, itty bitty rubber band thingies. And they left the room at least a septillion times each. “I’m tired”, “Can we be done?”, “This is taking f-o-r-e-v-e-r!”, “So-in-so isn’t doing anything! And I’ve picked up at least three Barbie shoes…it’s…not…FAIR!”. At one point my husband said, “It is a lot easier to clean the room if you’re IN the room”. “That’s a blog post,” I said. You know, I’m thinking about writing about 75% of the day. The other 25% is spent trying to remember what I was doing before I traveled to La-La-Writer Land or trying to help my kids with their math homework (oy!). When I’m thinking about writing, I often have fear in my periphery. Can I do this? Who do I think I am writing a novel about __________? Who told me I could do this? They were lying. Why would someone tell me I could do this when I. Can. NOT!?!? Other times, I’m avoiding writing. Yeah. I do that some times. I check Facebook to see if anybody liked my status update. I read the comment sections of news stories. I search the house for chocolate. I check to see if anybody wrote a review of one of my books on Goodreads. I text somebody. Take an Instagram picture of my coffee mug. Then there are days when I go to Starbucks, thinking it will spur me on to write more. But then I spy on the people there, wondering why that woman is ALWAYS smiling and nodding like that or why one guy is coughing so much (and hoping he keeps his icky germs to himself). Then I look up when Cheez Whiz was invented because THIS is important to know right this very NOW! In short. I have writing days that resemble the way my kids clean a room. 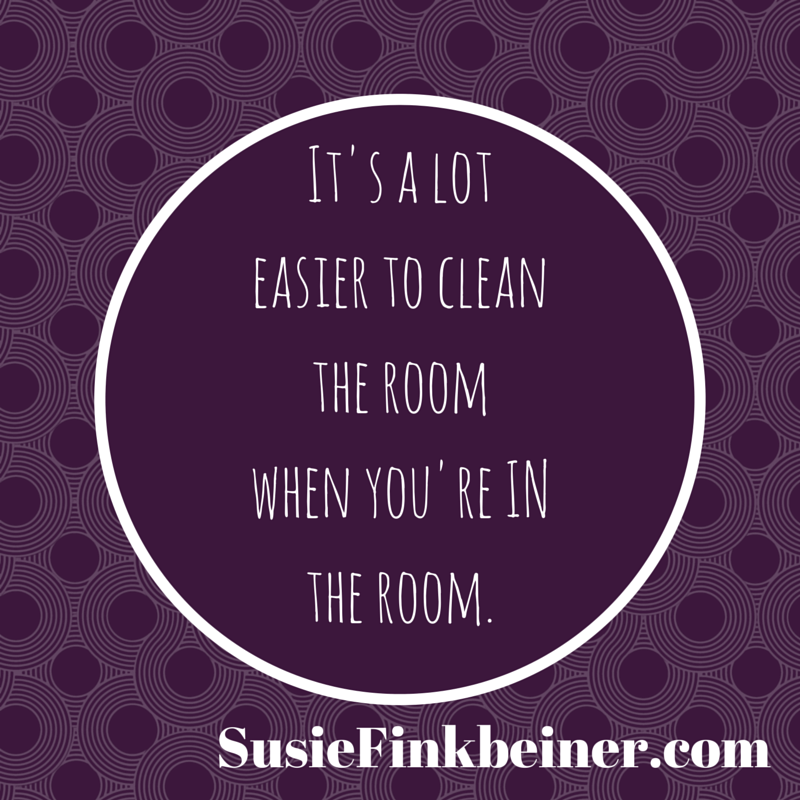 It’s easier to clean a room when you are IN the room. It’s easier to write a novel when you are…well…IN the novel. When you are focused, hands on the keyboard, file pulled up on the screen, characters and plot in mind. I suspect this is true for all of us, writers or not. It’s easier to get our purpose accomplished if we’re actually there and ready. I feel every word. And I’d like to add that often what keeps me from writing is really valuable stuff. I love having small group meet at our house, but by the time I get the house and dinner ready, then have the small group, then clean up after the small group, that’s four hours gone from each week. Multiply that times parenting the kids, other responsibilities, and a job, and then KABOOM. No writing time. See, this is one reason I don’t have people over. Cleaning is such a time sucker. It takes me twice as long to clean as normal people. Why? Because I get distracted. See. Full circle. Ha! I know that feeling, too. You’re vacuuming, but then realize the door is grimy. So then you run to get the cleaning cloth, and realize the sink is full of dishes. Three hours later you find the vacuum plugged into the wall. Exactamondo! You so get me. YES!! You are, as usual, in my head. GREAT post – and reminder. Ha! Your head is a nice place, Joanne. Is that weird to say? Oh, I’m so glad, Cathy. Thank you for reading. I’m glad you understand me. We’re all in this crazy life together, right?